Buy Cavinkare Nyle Naturals Clean and Shine Shampoo. Cleanses your hair naturally. getting rid of oil and dirt, giving natural shine. Every drop of Nyle Shampoo contains a unique Nutrition-boost complex, filled with the goodness of Aloe Vera, Water Lily Lemon and Amla. 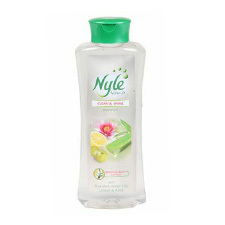 Nyle Naturals Clean and Shine Shampoo cleanses your hair naturally. getting rid of oil and dirt, giving it a natural shine. Amla: Amla contains vitamin C that makes your hair soft. Lemon: Lemon helps to maintain a clean sclap. Green Tea : Aloe vera moisturizes your hair and water lily helps maintain a healthy scalp.